Do you feel your scalp has become quite itchy in the recent past? There is a high possibility that you are suffering from a condition called dry scalp. This kind of a condition can be quite embarrassing and even irritating because you don't want to end up scratching your head in the middle of a deal breaking meeting. So what is dry scalp? Dry scalp is caused when the natural moisture in your scalp dries up or the balance is disturbed. The most common symptom of dry scalp is itchiness and is quite often associated with skin conditions or even ageing. The causes of the dry scalp can be segregated under internal and external factors. Let's take a look at both the factors. The good news is that dry scalp condition can be reversed and the bad news is that if you don't take any precautionary measure then it can become worse. Dry scalp can lead to a skin disorder called scalp psoriasis, which can further lead to extreme itching, skin infection, and even hair loss. You are probably wondering what would be the perfect solution for dry scalp. It is simple. All you need is to ensure your scalp is properly moisturized. There are various solutions available but shampoos work the best. Of course, finding the best shampoo for dry scalp can be quite the deal. In order to enable you to make an informed choice, we have researched and documented 6 dry itchy scalp shampoos that are most effective for dealing with dry scalp. 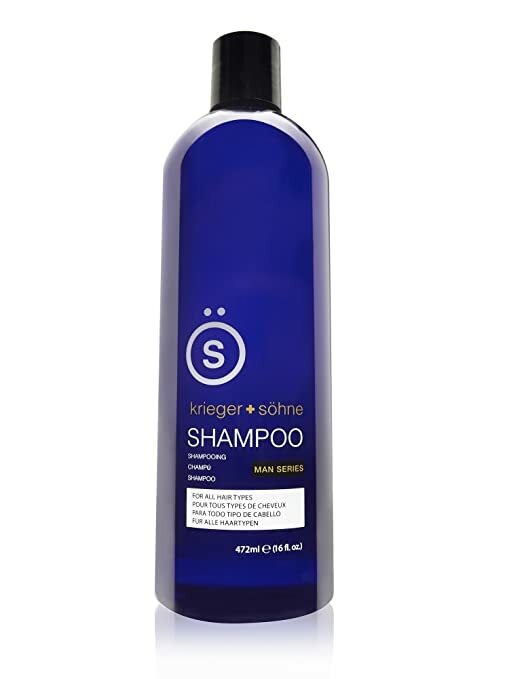 The Krieger + Söhne tea tree oil infused men's shampoo is a great product for men suffering from dry scalp condition, dandruff, itchy scalp, and inflammation. The primary ingredient in the Krieger + Söhne tea tree oil infused men's shampoo is tea tree oil, which is known to be highly effective therapy for a variety of hair and scalp treatments. It is also known as melaleuca oil and it varies in color from purely colorless to a pale or light yellow. It comes with a camphoraceous odor and is mainly derived from the leaves of the Melaleuca alternifolia plant. The plant is a native of southeast Queensland, Australia. The presence of tea tree oil itself put this shampoo on the best shampoo for dry scalp list as it is one really effective hair therapy product. Tea tree oil is proven to possess antiseptic, anti-microbial, and anti-inflammatory properties and they are just perfect for your hair and dry scalp. Why it is the best Shampoo for dry scalp ? It helps in fighting scalp conditions like Psoriasis and works its way deeper into your scalp to moisturize it wholly. The Krieger + Söhne tea tree oil infused men's shampoo is packed with ingredients that possess antibacterial properties and hence are able to fight off dandruff and keep it at bay. Free radicals: It does not contain chemicals that are harmful for scalp or hair including paraben, preservatives, and additives. Natural: This shampoo contains 100% natural ingredients including Peppermint and Lemongrass that provides proper nourishment to your scalp and keeps it dandruff free. Hair Types: This is a shampoo that works for all hair types including dry and oily hair. The Era organics argan oil shampoo has made it to the best shampoo for dry scalp list because it does more than just moisturize your scalp. It is a complete hair and scalp therapy that contains nothing but natural ingredients. The primary ingredients in Era organics argan oil shampoo for dry scalp include argan oil and manuka honey. Argan oil is derived primarily from the kernels of the Argan tree, which is native to Morocco and has several benefits for hair, scalp, and skin. This oil is rich in vitamin-E, which helps in providing nourishment to hair and promotes a well moisturized scalp. It also helps in repairing split ends and gives your hair a luscious look and feel. It has strong antibacterial properties and helps the scalp to remain moisturized for longer duration. It effectively fights itchiness and dandruff. The shampoo gently cleanses the scalp while ensuring proper blood circulation to the scalp and that it is well moisturized. The Era organics argan oil shampoo for dry scalp has a pH value of 5.5, which brings balance to hair and scalp. The shampoo is effective in reducing inflammation and itchiness and also increases keratin production. Free from paraben, SLS, and silicon. It is animal cruelty free. contains 100% natural ingredients that not only protect your scalp from losing moisture but also medical conditions like eczema and scalp psoriasis. contains Cehami, which is a powerful Australian botanical and helps in reducing inflammation, itchiness, and redness. 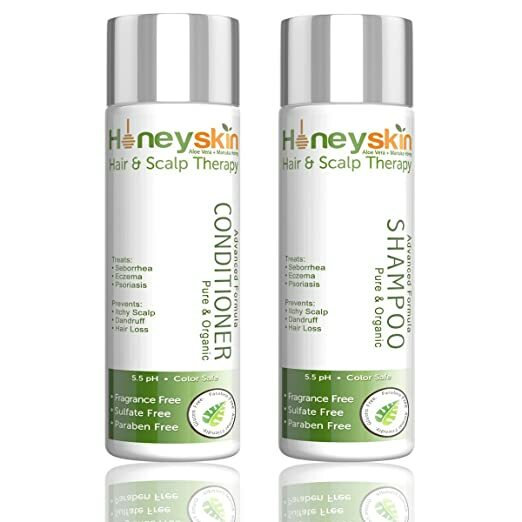 The Honey Skin Organics hair and scalp therapy is a complete solution for treatment of dry scalp condition. It is a boon in disguise for those suffering from itchy scalp and dandruff. 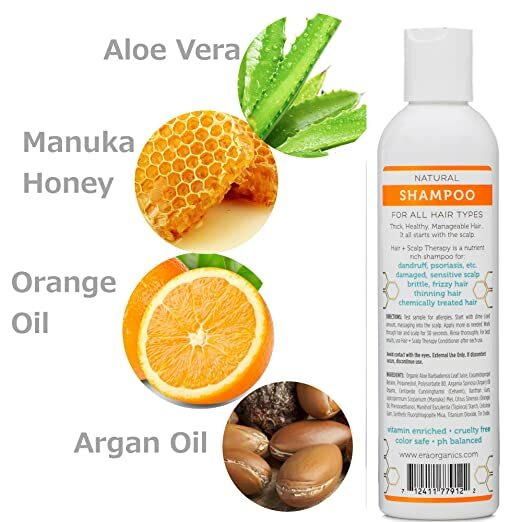 Why Honey Skin Organics hair and scalp therapy is considered the best shampoo for dry scalp? This is because of the primary ingredient, which is Manuka Honey. This is a different type of honey and is sourced from New Zealand. The name Manuka comes from the fact that this honey is produced by bees that help in the pollination of the native manuka bush. The most important component of manuka honey is Hydrogen peroxide, which gives it antibacterial properties. It also has antiviral and antifungal properties apart from the fact that it helps in providing moisture to the scalp and thus prevents dandruff and reduces itchiness. It contains natural ingredients and is so gentle that it can be used for a sensitive scalp like that of babies. 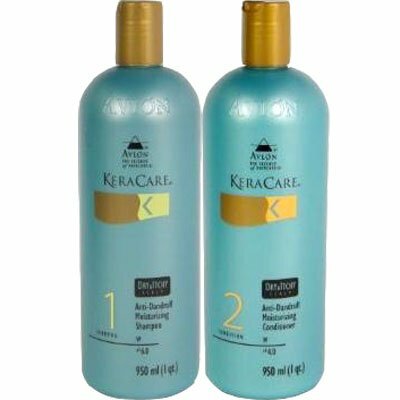 The Avlon Keracare dry and itchy scalp moisturizing shampoo is a soothing solution for your dry scalp condition and is aimed at removing itchiness as well. There are two primary ingredients in the Avlon Keracare dry and itchy scalp moisturizing shampoo and they are menthol or peppermint and rosemary. Peppermint apart from its mild fragrance has antiseptic and anti-inflammatory properties. It not only protects your scalp from any fungal infection but also helps reducing any inflammation and itchiness. It is meant to soothe your itchy scalp and balances moisture levels on your scalp. Rosemary on the other hand provides nourishment to hair follicles and the scalp. It also reduces thinning of hair, strengthens hair strands, and enables hair growth. Avlon Keracare dry and itchy scalp moisturizing shampoo contains ingredients that protects your scalp against dryness and minimizes itchiness. The Kerastase Specifique Bain exfoliant hydratant shampoo is one of those products that seem to stand out of the crowd. Yes! It works absolutely great when it comes to fighting a dry scalp condition and not to mention the intensive cleaning properties. There are two active ingredients in this shampoo and they are zinc pyrithione and glycerol. Zinc pyrithione is a coordination compound of zinc and is extremely effective in battling seborrhoeic dermatitis. It is extremely reliable when it comes to treatment of dry scalp and dandruff. It is more often than not, used in treatments for a variety of hair and scalp conditions including eczema, psoriasis, fungal infection, dry skin, and atopic dermatitis. Glycerol or Glycerin is a thick, colorless liquid that is sourced from plant oils like coconut oil and shea butter as well as animal fats. The reason why glycerol is one of the active ingredients is because it contains humectants that help in pulling moisture into your scalp and then ensure it is retained. The Kerastase Specifique Bain exfoliant hydratant shampoo has been made using a patented formula that not only provides proper hydration to the hair and scalp but also increase natural moisture levels. patented formula that is targeted at keeping your scalp properly moisturized and free from dandruff. contains microbeads, which gently exfoliate any dandruff that exists in the scalp and provides a clean and soothing feeling. Each of the 5 different shampoos contains a variety of natural ingredients that will not only provide relief from the symptoms of the dry scalp but also moisturize your scalp and hair intensely. The ingredients may be different but the purpose remains the same. It is recommended though to choose a shampoo with ingredients that you might not be allergic to! Tyme Iron Reviews: Does Tyme Curling and Flat iron works really? iGrow Reviews: Does igrow Laser Helmet work?